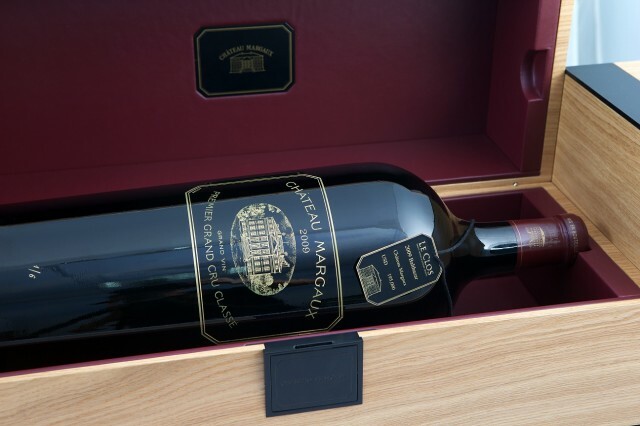 Fine wine shop Le Clos in Dubai International Airport has put a Balthazar of Château Margaux on sale for £122,000, making it the most expensive single bottle of wine ever to be retailed. The store has the exclusive retail rights to three 12-litre bottles of the Bordeaux first growth. This is the first time Margaux’s history that Balthazars have been bottled. A total of six were produced, with only three being put up for sale through Le Clos. A much-lauded vintage in Bordeaux, 2009 is said to be one of the best vintages ever produced by Margaux. The Balthazar is housed in an engraved oak case designed by French agency Partisan du Sens. Whoever splashes the cash on the bottle will be flown first class to France for a private tour of the vineyard and cellars followed by dinner at the château hosted by Margaux’s chief winemaker and managing director, Paul Pontallier. “To mark this fantastic vintage, we are delighted to create a unique opportunity by partnering with Le Clos to offer three Balthazars to the world’s international and discerning wine buyers,” said Pontallier. “Château Margaux’s history stretches back over 400 years. The 2009 vintage is one of the finest we have ever produced, hence why we chose to bottle it in this magnificent format,” he added. “To be given this honour by Château Margaux underlines Le Clos’ position as a world leader in bringing rare fine wines to market,” said Oliver Dixon, head of fine wine at Le Clos. Among the wines purchased were single bottles of Château Pétrus 1947 and 1961, and a magnum of Pétrus 1959.